The steel furnace is the second-tier of furnaces. Compared to the stone furnace, it smelts at double the speed and therefore is a more efficient use of the given fuel. Steel furnace is comparable to electric furnace in terms of smelt speed, however the latter can make use of modules (as well as electricity) to further enhance the furnace's capabilities. 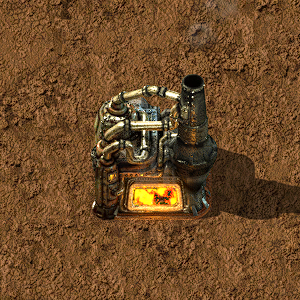 A steel furnace can replace a stone furnace without mining the stone furnace first. This can be done by clicking on the stone furnace with the steel furnace in the players hand. This will also move all items in the stone furnace to the new furnace. Smelting speed updated to make ratios nicer with new belt speed. Energy usage updated to keep coal usage the same with new fuel energy values. This page was last edited on 17 March 2019, at 04:26.